We rate this as four bottles owing to its combination of really good track side viewing in an otherwise slightly inconvenient (but very accessible) location. None, other than to be aware of location and distance to the village. Experienced operator in good location. Its a walk to anywhere but the great trackside view. Viewing now "private" on this bank of the Porsche Curves. On the outside of the Porsche Curves from the D92 roundabout. Access is straightforward. I've stayed on this site in 2012, 2015 and 2018. I can't compare it to other sites as this is the only place I've stayed at Le Mans. - Facilities: 3 shower blocks and 3 toilet blocks. Never had a queue for the showers, very small queues for the toilets at certain times. Facilities are constantly cleaned. - Quiet site: this could be good or bad depending on what you like. No craziness that you may get on the other sites. - Location: it is a bit out of the way for the rest of the circuit. The tram takes 45 mins to walk to, front straight area 25 mins, Tetre Rouge an hour on the outside of the circuit. Bring comfortable shoes. 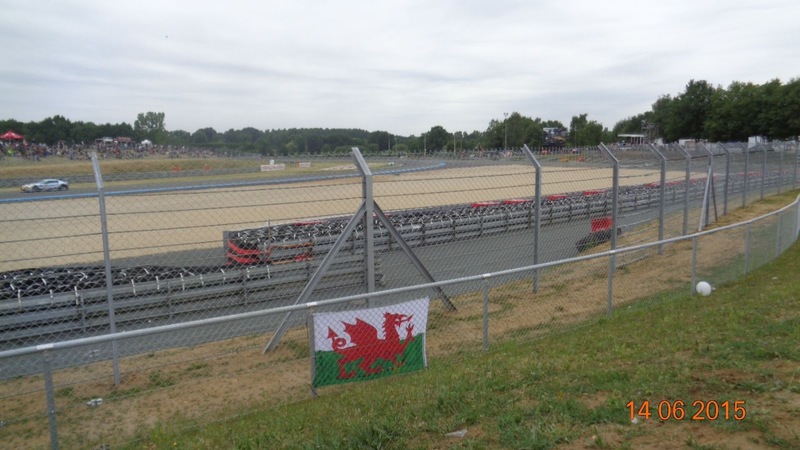 - Noise: right next to the circuit. There is no relief from the car noise, light sleepers beware. Overall this site would suit people who like things to be organised for them. This suited me, our group live in London so most people don't have a car. We were able to turn up on the train on the Thursday and know everything would be ready for us, with 13 people to herd this made life a lot easier. It's away from the main circuit action but over the course of a weekend there's plenty of time to see all the areas anyway. Arnage village is a 30 min walk and has plenty going for it. 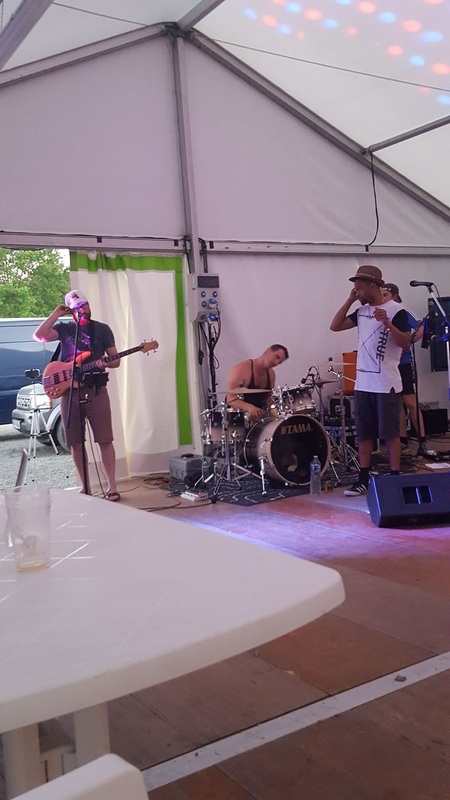 The staff are friendly, the bar is 40% cheaper than on circuit, and you have a great viewing location right at your tent. As long as I'm arranging the trip I will use this campsite. Travel Destinations is a private camp sit organised and run for Travel destinations by en-tente-cordiale an English event company. Campers are mainly from the UK but this is not exclusive. 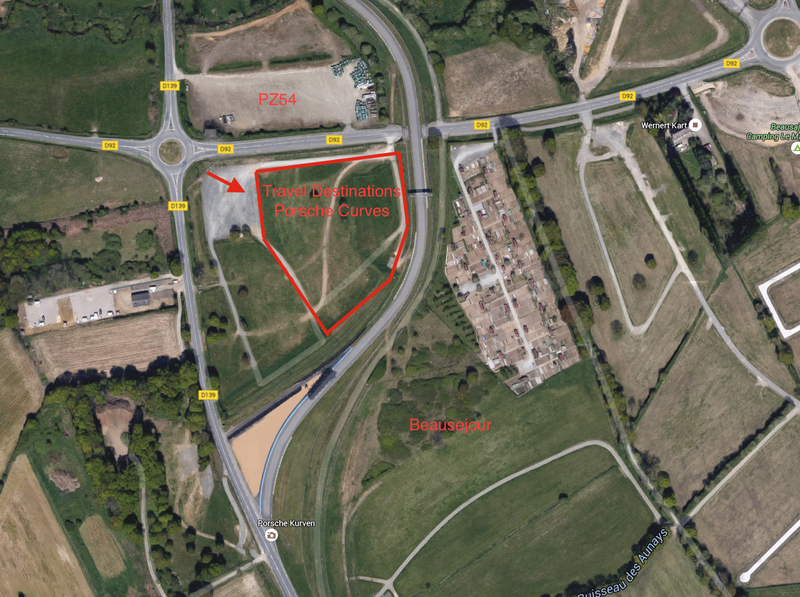 The site has allocated pitches 7 by 5. 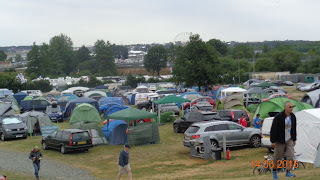 It caters for people with their own tents or you can book a pre erected tent. The Site is open from Wednesday morning before the race until Monday morning after the race. The field is very secure with security 24/7 at the gate with entry by wrist bands that have to be worn at all times. 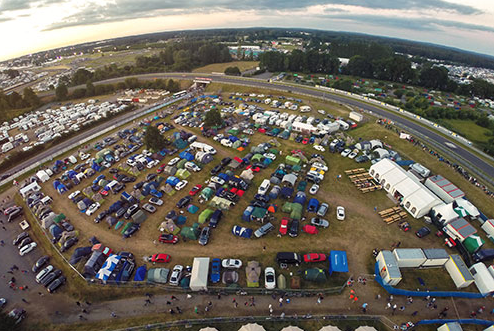 The camp site is located on the outside of the circuit at the Porsche Curves with the gate just before the bridge under the track. The Walk to the village area takes about 30 mins but there is a little land train that goes from outside Beausejour camp site about 100 yards further down the road which runs during the race but stops at immediately the race finishes. 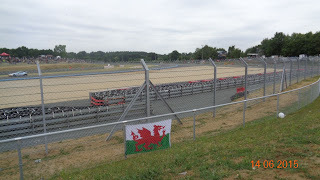 However, a major advantage is it is across the road from the bus terminus that takes you to and from all the main corners around the track during the race. 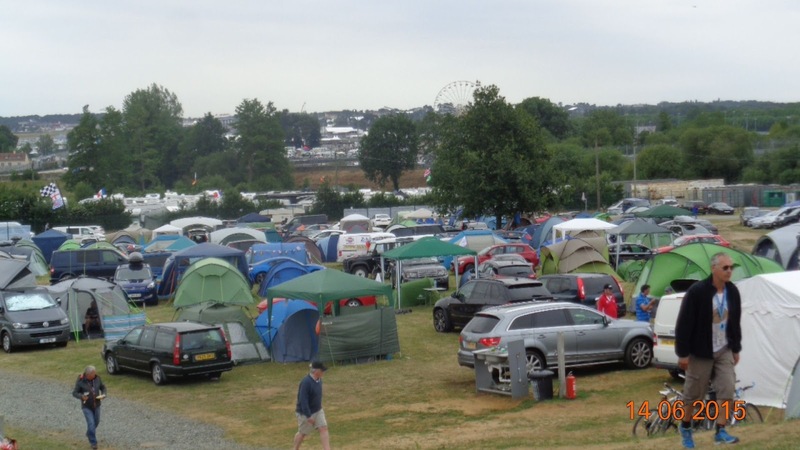 The site has a hospitality marquee serving food, cold beer, wine and soft drinks at competitive prices. At breakfast time they do bacon, sausage and egg baguettes or coffee tea and croissants. Every night they do a different main meal as well burgers and fries that are available all day. Some people have commented that the portion sizes are a bit on the small side and not always as hot as it could be but if you don’t have your own cooking facilities or the time, it can come in very handy especially on Saturday night when the race is in full swing and you can do a quick pit stop before going off to watch the night time racing. 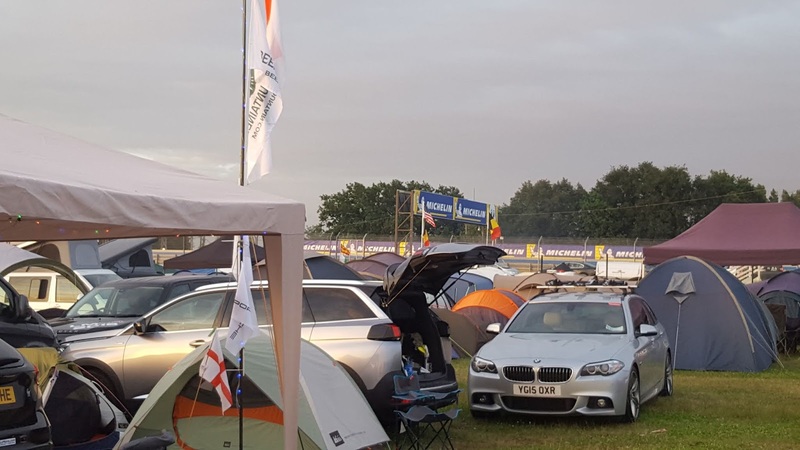 The best thing going about the camp site is you get your very own private viewing bank where you can look out across the start of the Porsche curves. 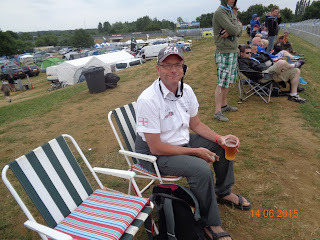 The bank can become quite crowded at times but people tend to come and go and you can usually wander up with your chairs, beer and wine and find a space a very good way to watch the race. The site provides a well maintained shower block The “Cess” tanker turns up several times a day to prevent a backup! The toilets are checked and cleaned several time a day by the camp site staff. The showers are a bit on the small side especially if you like to swing cats while showing but generally speaking they provide hot water for all but avoiding the peak times also helps. 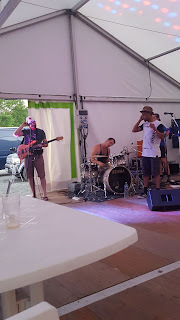 Evening entertainment is provided by the house band who have put on a good set on Friday and Sunday evening for the last 4 years playing popular rock covers and getting everyone up dancing. 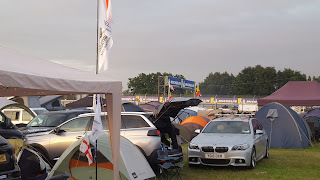 It’s not the cheapest way to “do” Le Mans but if you are done with roughing it and hearing the base beat of Euro pop at 3 in the morning then it could be what you are looking for. Location for Buses to Arnarge.and Mulsane Corners. Endless supply of cold beer on tap.